Boy, do I have a treat for you today! It begins with pork and ends with chops from a brand spankin’ new cookbook called The Paleo Foodie. 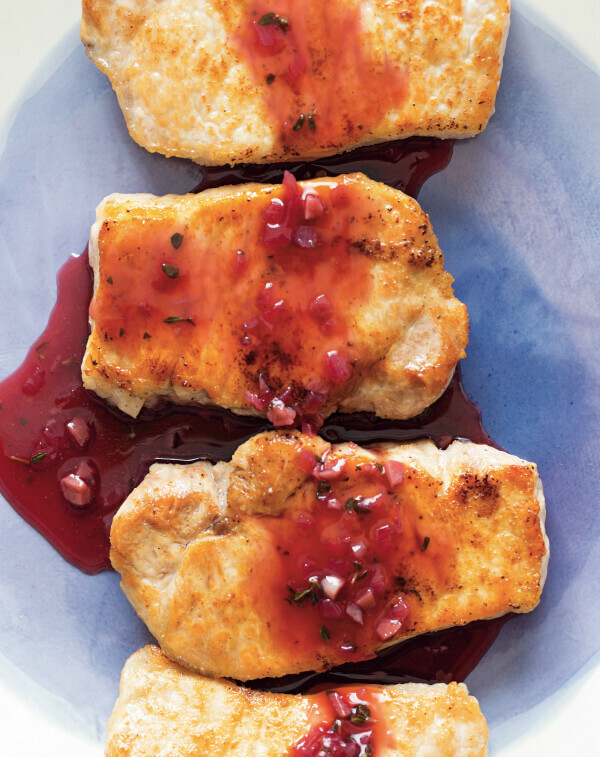 But not only that – these juicy, tender pork chops are smothered with an amazingly flavorful pomegranate ginger sauce. It’s divine. And this recipe is actually very simple to prepare. You can totally impress anyone with these babies. Just look at this pic – am I right?! The Paleo Foodie Cookbook is a brand new hardbound cookbook by my friend, Arsy from the blog Rubies and Radishes that you’ll definitely want to own. Arsy has the knack of turning ordinary food into these gorgeous masterpieces that are full of flavor. I especially love the International flair she brings to her a lot of her dishes. And don’t be fooled – the recipes in The Paleo Foodie are simple to prepare, too, which is always a big bonus in my world. Learn more about The Paleo Foodie Cookbook HERE. 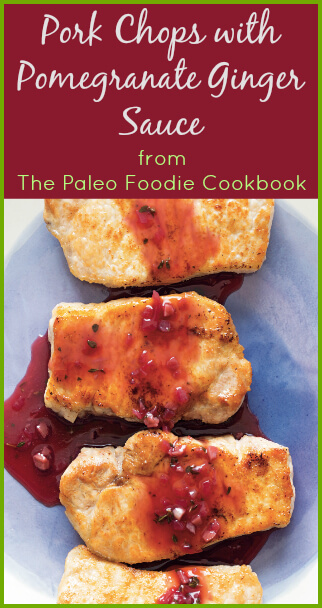 Pre-order The Paleo Foodie Cookbook Now and Get a Bonus! If you pre-order the The Paleo Foodie Cookbook on Amazon now (pre-order HERE), you can get a free copy of The Paleo Foodie Dinner Party ebook! Just email your receipt to paleodinnerparty at gmail dot com to get your free copy. In a medium-sized saucepan, combine all of the ingredients for the pomegranate-ginger sauce, except the arrowroot starch. Cook until reduced by half, about 10 minutes. Remove sauce from the heat and set aside. Once the sauce is cool, strain it through a fine mesh strainer to remove the solids. In a small bowl, mix coriander, onion powder and garlic powder. Rub the seasonings mix on both sides of the pork chops. Generiously salt and pepper. Heat a large skillet to medium-high heat. Once the pan is hot add the coconut oil. Place the chops in the pan and make sure that they are not crowding each other too much. Cook chops on each side for about 4 minutes or until well browned and cooked through. Remove the chops from the pan and set aside to rest. 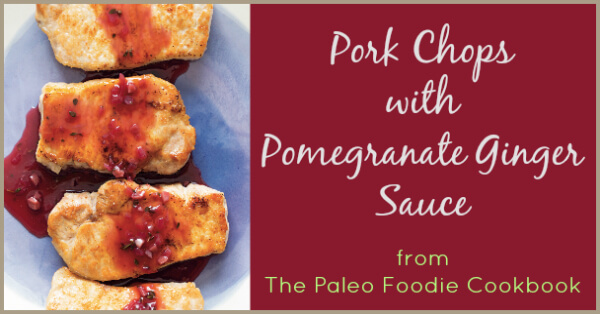 As your chops are resting, add the strained pomegranate-ginger sauce to the same pan and bring to a simmer. Stir for a couple of minutes and scrape up any browned bits. Place your arrowroot starch in a small bowl and add enough filtered water to make a thin paste. Add this paste to the sauce and whisk until the sauce is slightly thickened. Spoon the warm sauce over the pork chops and serve. 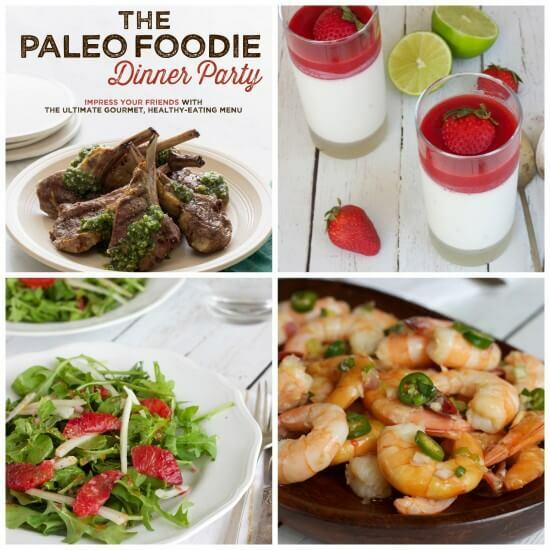 Enter to Win The Paleo Foodie Cookbook! I’m definitely making this for dinner soon! That recipe looks delicious! 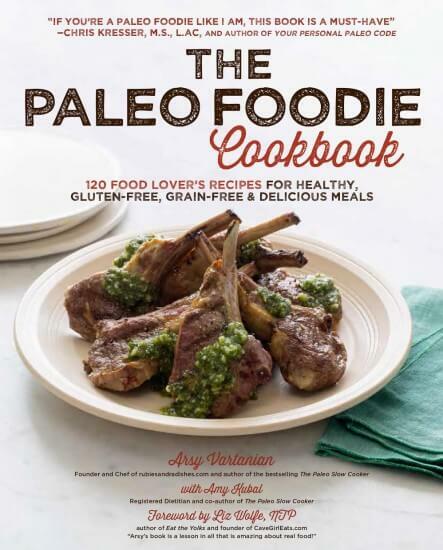 Thanks for giving us a sneak peak — I have had my eye on The Paleo Foodie Cookbook — being a foodie and all! 😉 The cover is gorgeous and I’d love to have it. Thanks for offering the giveaway! This looks delish! Maybe I can finally get my hubby on board with the taste of pomegranates. Those pork chops look delicious. Came at the right time, since I am cooking pork chops for dinner, and I actually have all the ingredients. I’d love to win this book! It looks amazing! That looks so good! I am pretty sure I just figured out what I’m making for dinner tomorrow night! This looks delicious, love Arsy’s recipes. I’ve actually got some pork chops left over from my meat order sitting in the freezer, this looks like a perfect match. Love your blog also, I made your raw liver pills about 2 weeks ago and it has been a blessing, I had a little left over after cutting the little tiny pill size pieces for hours so I figured I’d try and cook some liver with onions and so on……could not get the taste out of my mouth quick enough….next day I had the frozen liver pills…no taste at all…thank you so much, I certainly feel it now if I miss a day. Also tried your protein workout smoothie and it was delish. Thank you for posting this recipe! Now I REALLY want this book!!! This looks delicious! I would love to win the cookbook! This cookbook sounds like a great addition! What a great recipe!! I want the book!!!! this looks so delicious! I am super interested in the cookbook now, thanks for sharing! Could you please tell me where I can find Arrowroot starch? Looks like a great recipe and a great cookbook! Recipe looks delicious! Cant wait to try it!! Thanks for the awesome giveaway!! Yum, that looks great!!! Thank you! I am so impressed with the recipes that have been shared from this cookbook. Wow!